Harvey Ray, age 85, passed away at Tomahawk Health Services with family members by his side on January 15, 2019. He was born May 16, 1933 in Phelps, WI to Al and Leona (nee Mc Dermott) Ray. He moved to Lansing, MI where he met his wife Doris (nee Soloman). He worked for Soloman Brothers, one of the largest construction companies in Michigan at the times, as a project manager before retiring to Phelps in 1999. Harvey served in the Army and is a veteran of the Korean War. He is also an American Indian and a member of the Little River Band of Ottawa Indians in Manistee, Michigan. He was very proud of his heritage. He loved classic cars and Corvettes. He enjoyed the outdoors, working in his yard and collecting rocks. He watched hockey and of course, the Packers! His special love was his dog, Lady. 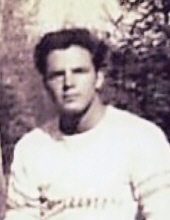 He was survived by daughters: Jane (Jim) Coblentz and Kelley Rae (Allan) Hoisington; grandchildren Kim Bryan, Jarret, Jayden, Bree, Meganne and Michelle; great grandchildren Ava, Demi, Summer Rae and Scarlet; half-brothers: Don and Ross Ray; nephew Eddy Kish; special cousins Steve (Kathy) Ray and Pauleyn Nystrom; and many other loving family members and friends. He is preceded in death by daughter Carol Schiller; son Michael Ray; wife Doris; parents Al and Leona; sister Arlene Kish; and half-brothers: Allen, Jim and John Ray. A memorial service will be held at 12 noon on Friday January 25, 2019 at the Twin Lake Bible Church. A visitation will be held one hour prior to the service. A luncheon will follow the memorial service. To plant a tree in memory of Harvey Ray, please visit our Tribute Store. "Email Address" would like to share the life celebration of Harvey Ray. Click on the "link" to go to share a favorite memory or leave a condolence message for the family.